Preheat the oven to 200˚C, gas mark 6 and smear the butter over the base of a baking dish. Snip off the tough stalks of the figs and cut each fig in half. Place in the baking dish, cut side up, and sprinkle with half the caster sugar. 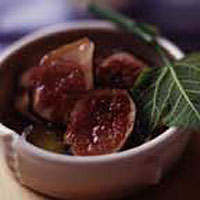 Mix the lemon juice with the orange flower water (if using) and sprinkle over the figs. Place in the oven and bake for 15 minutes. Baste liberally with the juices before sprinkling with the remaining sugar and baking for a further 5 minutes. Serve hot or warm with crème fraîche or Mascarpone.